The Rake explores the myriad adventurous adornment options open to the man who has tired of the conventional neck-tie. Indigo People's Iguru eagle print batik dyed bandana worn with a Breton stripe and denim shirt. Photograph by James Munro. This is precisely the quality required to successfully deploy what we’ll call for the purposes of this article ‘alternative neckwear’. Sporting a standard neck-tie — or even its quirky sibling, the bow-tie — is a highly conventional, conservative move. Going tie-less, in these days of ever-increasing informality, is even simpler… and even less courageous. But employing alternative neckwear? That takes testicular fortitude, my friends. Bravest of all non-standard neck adornments is the much-maligned bolo tie. Comprising a cord of leather with decorative metal tips, fastened around the collar with an ornamental clasp (often Native American silverwork, inset with topaz), the bolo tie was invented in the late 1940s, and has since become a Western style staple — the official neckwear of Arizona, Texas and New Mexico. In film and real life, it’s been memorably worn by a collection of rebels, bad boys and outcasts, including John Travolta’s Vincent Vega in Pulp Fiction, John Cryer’s Duckie in Pretty In Pink, Bruce Springsteen on the cover of his Tunnel of Love LP and musical iconoclasts Joe Strummer, Bob Dylan, and Leonard Cohen on stage. 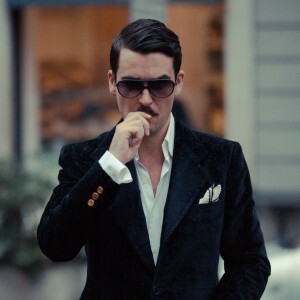 The cravat — as seen on cinematic alternative neckwear enthusiasts including Al Pacino’s Michael Corleone, Robert Duvall’s Colonel Kilgore, Sean Connery’s James Bond and Edward Fox’s Jackal — is another bold style move. Military in origin, it takes its name from the scarves of Croatian mercenaries in the service of Louis XIII in the early 17th century, who would ornately knot cloth around their necks to serve as a psychological shield against wounds to that vital, vulnerable area during battle. The French adopted the affectation in non-martial settings, bastardising ‘Croat’ to ‘cravate’. Then, as now, a cravat could be made of any type or grade of cloth, from rough hemp or flax to the finest silk. The cravat gradually evolved into the standard tie of today (which the French still call ‘une cravate’), its original generously raffish, Brummelesque form growing ever and ever rarer. A particularly sophisticated iteration of the cravat, tied under the collar, took on the name of the Ascot races where it has long been worn as part of men’s morning dress. Initially considered informally elegant, today, in anything but the fanciest of settings, the Ascot is generally seen as the mark of the fop — though we at The Rake prefer to think of it merely as one of many neckwear choices available to the confident gentleman. 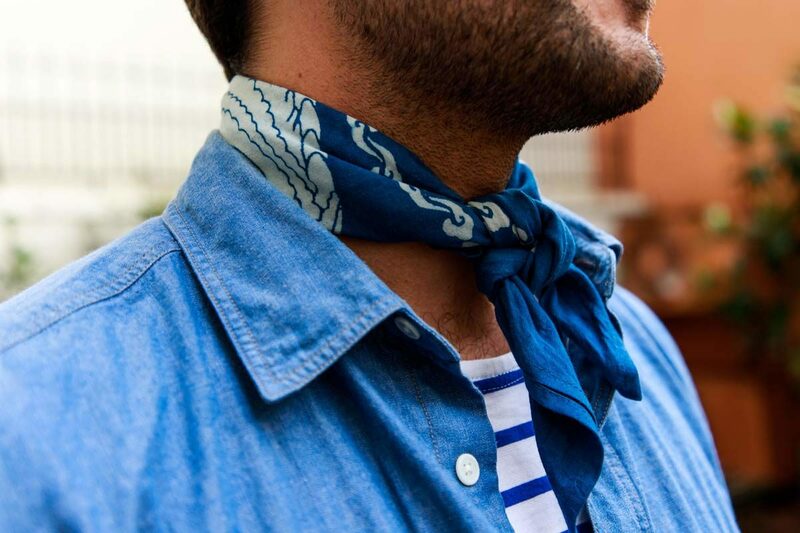 There’s a growing fondness among the menswear cognoscenti for the cravat’s casual, rustic cousin, the neckerchief. The name is a curious multilingual portmanteau, adding the English ‘neck’ to ‘kerchief’, derived from the French ‘couvre-chef’, meaning ‘cover the head’. As the chimeric moniker suggests, this is a cloth originally intended for wearing on the head that has been adapted to neckwear — boy scouts and various navies having institutionalised the move. They serve a more practical purpose than silk cravats; normally cut from cotton or linen, neckerchiefs blessedly possess absorbent qualities that ameliorate the effects of perspiration on warmer days. The paisley-patterned bandana (its name derived from the Sanskrit ‘bandhana’, or ‘bond’) is perhaps the most iconic of neckerchiefs. While this staple of cowboys, blue-collar workers, Compton gangstas and the Castro District’s more leathery denizens can be had cheap’n’cheerfully, if you’re willing to invest a little more, Japanese brand Kapital makes some real beauties. Cut from the finest selvedge cotton, with designs blending Americana and traditional Japanese art, Kapital’s bandanas are the work of designer (and passionate vintage bandana collector) Kiro Hirata, who founded the label in 1984 in Japan’s denim epicentre, Kojima. Indigo People, meanwhile, employ the wax-based batik dyeing process to imbue their stunning blue bandanas with motifs of the east, utilising the skills of artisans in Asia who’ve been experts in batik for millennia. Whatever your choice of alternative neckwear, be sure to wear it with pride and — as Mr Lauren suggests — a healthy measure of confidence. Robertas Aukstuolis wears a Private White V.C. mink grey silk Star Wars print scarf with a grey silk and wool jacquard jacket and ivory dress shirt. Photograph by David Goldman.